I wasn't joking last week when I said that I'd been sewing lots of basic tops! 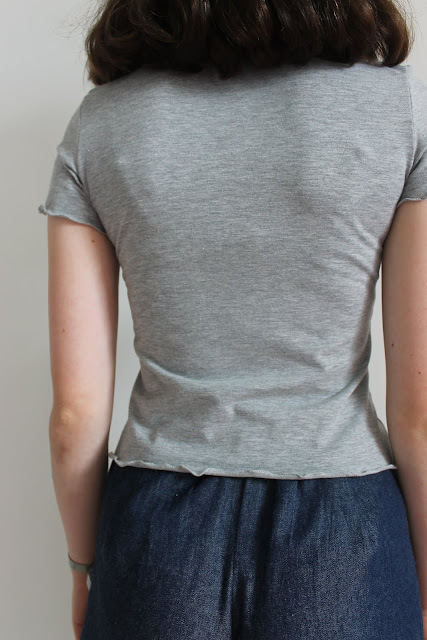 This is another top that I love and has quickly become a staple, depite being such a simple idea and design. I have been wanting a simple grey top for a while and was originally going to buy one. However, the shop in question didn't have my size in stock, and as I found myself wandering through the John Lewis fabric department I realised: why don't I just make it? Don't get me wrong, I rarely decide to buy an item of clothing that I could make, but for some reason I had decided that it would be best to buy this grey top so that the length, fit and style was right. But I realised that the length, fit and style is never perfect unless you make it so that those categories can be ticked off exactly how you want them to be. This top pretty much sums up one of the many reasons that I love sewing: you can make it exactly right when you make it yourself. Quite often, I find that it is much cheaper to buy an item of clothing rather than make it. But with this top it was actually the other way around. As I mentioned, I wasn't planning on making this top until I found the perfect fabric in John Lewis. I only needed to buy 0.75m so I ended up with a lovely shade of grey, good quality fabric and a top which I could design to match exactly what I wanted in the first place. Can you tell by now that I'm delighted that I made it?! Moving onto my favourite part of this top: the Eiffel Tower patch! I bought this patch ages ago, when I visited Frou-Frou. For such a long time I've been unsure on what to use it on, but I'm really glad that I waited as I think that this is the perfect project for it. It's quite a subtle badge but has a nod to giving this top a more personalised touch. It also carries the happy memory of my trip to Paris with it. The other main feature of this top is the hem. I decided to experiment a bit on the hem by sewing a lettuce hem. It's not something that I've ever done before and I wasn't entriely sure about how it would look, but I really enjoyed learning a new skill and I actually really like the look of it too! Again, it's quite a subtle feature but adds a nice extra interest to the top. 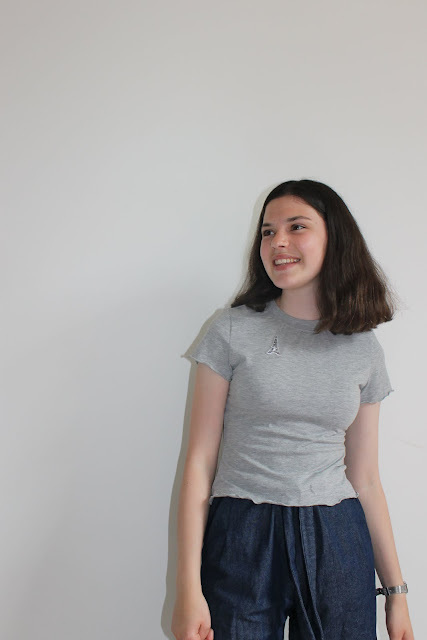 This top was sewn with the same self-drafted pattern as my black top, yet they look really quite different! I've already worn this one a lot too, and especially love it with my wide-legged trousers. By no means is this top perfect. Sewing something yourself will never be as precise as something sewn in a facotry. But I was able to make something that I love, that is exactly to my taste and style because I designed it. Something that has a personalised touch, that carries memories, that I know will last a long time because it is made out of a good qualtiy fabric. And for those reasons, sewing is a superpower. Thank you. That's such an interesting point, I definitely agree that I notice tiny mistakes in homemade clothes that I wouldn't in shop bought ones! I love this top! The lettuce hem makes it so feminine looking. I like the patch you put on. I've been to Paris and now I wish I would have thought of buying little patches like that. Thank you so much! I didn't actually buy the patch with a t-shirt in mind but I love how this one has turned out so I'll definitely think about buying more patches from other places now. I agree that sewing is a superpower! I have definitely gotten to the point where I can't buy things because I can sew them, lol! You did a wonderful job creating what you wanted, and adapting it to your liking with the patch. It looks nice with the trousers! Yes - that's exactly how I feel! It's now become impossible to buy things that I know I can sew. Thank you so much!